Did you know bed bugs can hide behind baseboards and in cracks, crevices, and folded areas of beds, bedding and adjacent furniture, especially mattresses and box springs? Not only that, an adult female can lay an average of 5 eggs per day, and more than 200 to 500 eggs in a lifetime. The adult bed bug is about 4-5 mm long (1/5 in long) and it has a flat oval shape and light brown color before eating. But after eating they become round and deep in body color. Bed bugs usually come out at night for a blood meal, going out for food one hour before dawn, seeking the target by sensing the body temperature and exhaled carbon dioxide. They can consume about 4 times more weight than their body weight in 15 minutes. Whenever someone encounters a bed bug problem, the first thing they think about is “How can I get rid of the bed bugs? Or, How do I kill them?. Most people try a DIY solution thinking bed bugs are easily to get rid of however, they are not. Bed bugs have developed a resistance to most of the most common pesticides. Therefore,if a proffessional is not involved in the process, it may be difficult to get rid of the bed bug and have a good chance of re-infestation. 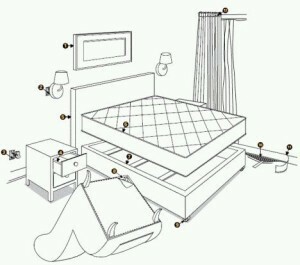 1.- Heat treatment; the best way to get rid of bed bugs in one day. For more information on our treatments, please call or Whattsapp to make an appointment for inspection so that we can provide a suitable treatment plan and quotation. Don’t let the bedbugs bites, We Kill Bedbugs . ⟵Don’t let the bed bugs bite….